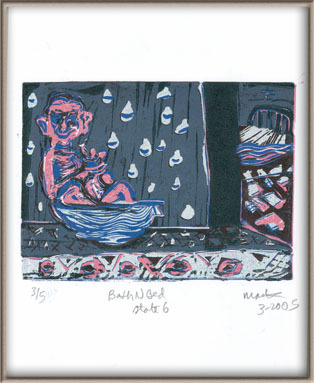 The linocut shows baby bob taking a bath on grandma's kitchen table. 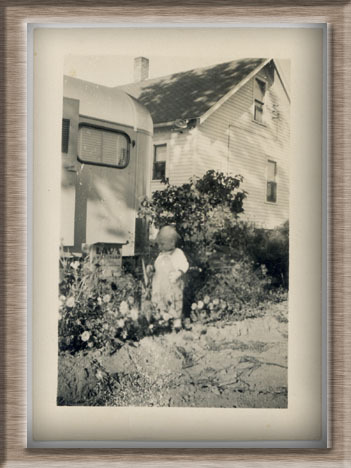 This photo shows first child bob at one year old. 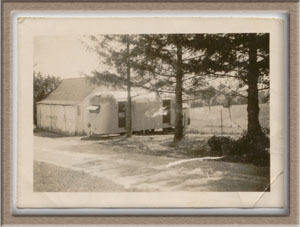 the trailer is parked by mother's parents house for mom, dad, and bob to winter here. They had pulled the trailer 150 miles south the previous summer to operate an A&W root beer stand and then pulled it back up north for the winter off-season. I remember the oil cloth tablecloth, later where we would eat breakfast and watch grandpa cut up his pancakes into squares before he started to eat any bites. or where grandpa would use his stubby fingers to shuffle the deck of cards for another game of solitaire or shuck and shell the walnuts we had brought the fall before. I remember the sharp roof of the attic because later us kids spent some nights there. seeing the bare wood on the inside and not being able to stand up in the corner because of the steep roof were letting us in on a secret world. Next year there were two boys. 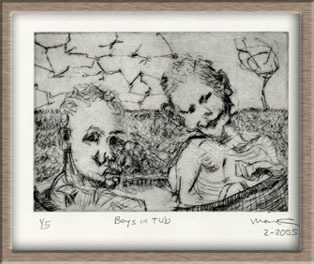 they were small enough to be able to bathe in the same tub. the trailer is parked somewhere in pleasant wisconsin where for 3 seasons of the year it is pleasant. we love to bathe outdoors.